LB and Chictopia is maybe one of the sites that had given me so much of ideas and inspiration about the latest trends and fashion. That makes me check both of these sites from time to time. When Chictopia launches its first “I die for DIY Costume Contest” I felt so excited and think that I should try to make one. I love crafting clothes as I love to design them so what we did was to immediately come up with something that we could done by ourselves and of course since my sisters and I are working then we have to think of something that is quick, easy to make and most of all is something that would not cost us too much. And now here it is a black hooded dress, seems like metallic and leathery at first glance. This black hooded dress is cool. It can be worn two-way, first is the dress alone and second is with the hood. We paired it with one necklace to maintain it entirely done by ourselves and put on a twist to the entire look. So how it was done? Was it easy? Yes it is, it only took us about 3 hours to have it done. Was it expensive? Definitely not, I only spent less than Php90.00 ($2.00USD). 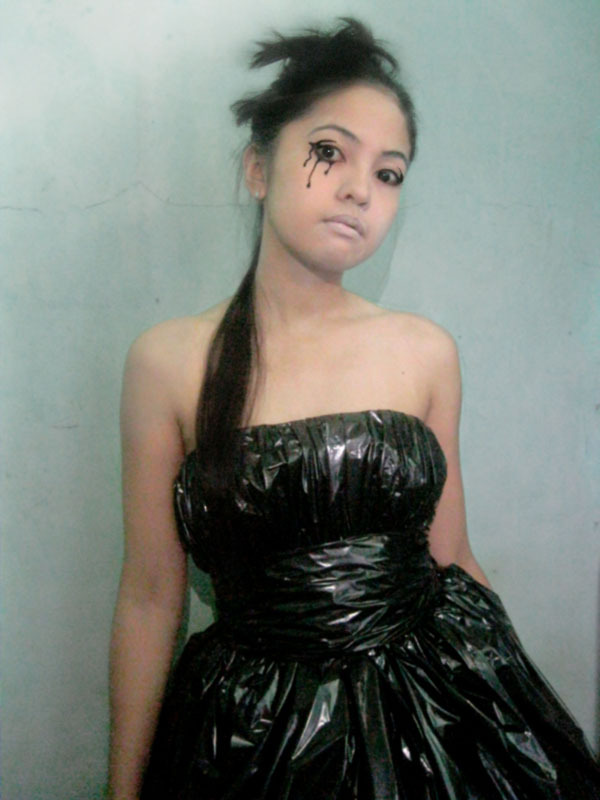 The dress was made up of trash bags (we bought ten pcs for a bucks) :) I cut it down and just bring them together totally the same as how to make a dress. I did the hood separately aiming to have the dress worn in two ways. 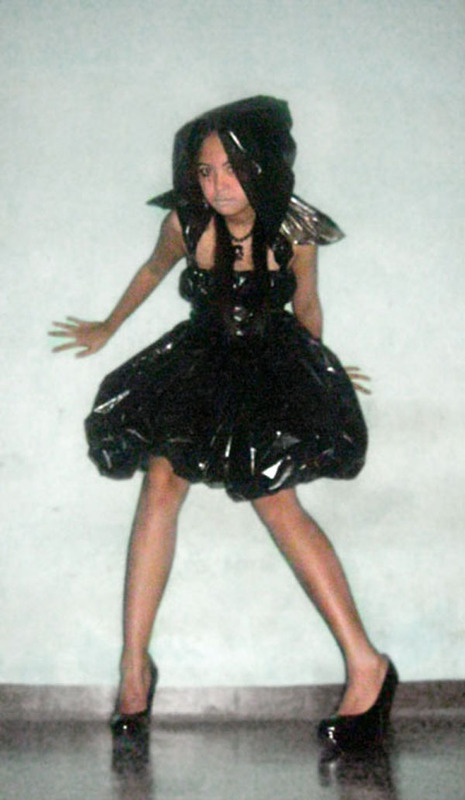 I personally design this dress and honestly thinking of lady gaga hash, I first meant the shoulder to be like those with power pads but I guess it didn’t seem like one. I still find it cute anyway. Okay and now the necklace, this one is quite special for me. I have owned this for four years now and its one of my favorite. I am the one who made this. The bug pendant is made of a real bug’s head, a big bug called rhinoceros beetle. Ops!!! I didn’t kill one for this. I saw this dead bug and I brought it home then I had the idea of preserving the head. It took a while for the cleaning and drying process and after all I realized that it can’t be displayed in the wall like of those deer skulls and horn because it’s too small. Next thing I did was I grab old black wooden beads and nylon and put on the bug. Tada! It’s now a spooky necklace. I love wearing this for Halloween and everyone is having much fun of touching the bug’s head because until now it’s still very shiny and fury at the lower part. This one is definitely amazing or should I say spooky. Thank you very much for your comment, beautiful! Very original dress! Well done! Brava! Love this idea! Your so creative and fashionable. Good job !!! I promote spanish designers in Qatar, would you like to follow each other? Wasn't it very sweaty coz of all the plastic?